Eating L.A.: Ozu East is Stylish and Cute, But How's the Ramen? Ozu East is Stylish and Cute, But How's the Ramen? Almost overnight, Atwater has become the kind of neighborhood where restaurant patrons have a pretty good chance of recognizing the name of the great Japanese director Ozu. But you don't have to be a foreign film connoisseur to appreciate the minimalist style and modernized fusion menu at Ozu. Owner Paul Yi has worked as a film producer and executive, and shows his appreciation with a variety of visuals playing on one wall, from Ozu classic Tokyo Story to E.T. to basketball games. 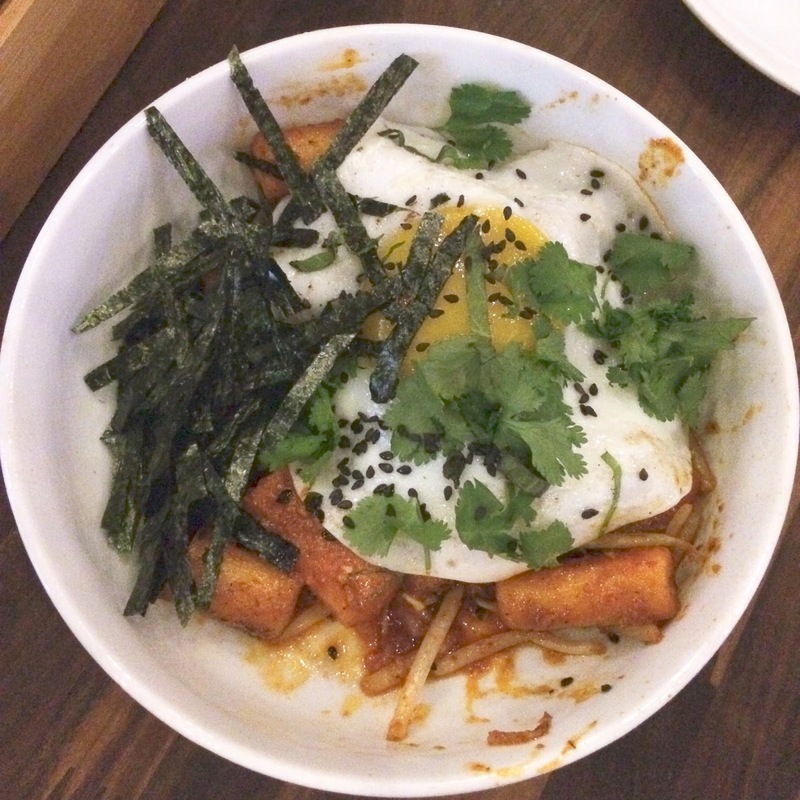 The fusion dishes lean towards Japanese, but with a healthy influence from Yi's Korean heritage. Crispy Rice cakes combine the chewy Korean noodles slicked with chili viniagrette and topped with an egg, is one of Ozu's best dishes. Spicy tuna omisubi is a tasty square version of spicy tuna roll. Everyone wants to try the avocado toast, which uses crispy rice where the bread usually sits, and it's a clever variation. The fusion version of a Cobb salad includes Kurobata ham, egg and edamame, but has neither the substance or flavor of the real thing. Chicken-fried tofu is decadent and fun, but like many of the other dishes the mayo, soy and jalapeno create a rich, spicy and salt flavor profile that easily ends up overwhelming, especially in the creamy mayo area. Fried rice topped with a fried egg is another greasy but satisfying dish. The trouble is with the ramen – but since the ramen is the centerpiece of the fairly brief menu, it's kind of a major problem. The addition of black garlic oil in the chicken ramen gives the broth an unpalatable bitterness that left us unable to finish it. Pork ramen also proved unfinishable, due to way-too-salty broth, and the noodles themselves are average. We also tried kimchi udon noodles with shrimp, but the kimchi cream sauce was cloying and way too rich. It's early days yet, so for now order a glass of Acorn Saison and some chicken-fried tofu and avocado toast to snack on. Perhaps Yi can bring in a ramen consultant, because the neighborhood is rooting for Ozu to become a great casual neighborhood spot. An ice cream annex is slated to open soon.